The Extra Small Shallow Plus for Strobe applications is designed for use with a studio flash with a protruding dome such as a Profoto lamphead. With fabric not rated for the heat of a continuous light, the Small Shallow Plus for strobe applications is ideal for work in cramped interiors where medium softening of your studio flash is desired. 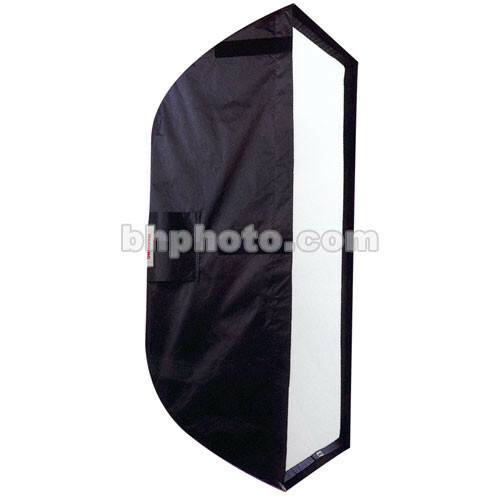 The "Plus" designation of this softbox means you can remove the front face of the softbox if you like. Chimera makes different strengths of diffusion material for front face applications. The softbox comes with a one stop diffuser. A 1/2 grid, or 1/4 grid cloth may be purchased separately, when a less-soft light is desired. For use with a strobe head that has a protruding flashtube. It is not recomended for use with heads having built-in reflectors such as the Dyna-Lite 2040 lamphead or Novatron lampheads. The shallow depth of this softbox would not allow the light to spread out adaquately within the box. Exposure would not be even across the entire front face of the softbox. Recessed front controls light spill and allows attachment of an optional fabric grid. Easier manuvering in cramped interior shoots. Required Speed (mounting) Rings are available separately for many manufacturers' strobes. Box Dimensions (LxWxH) 21.0 x 4.0 x 4.0"
Super Pro Plus Shallow Bank Xtra Small is rated 5.0 out of 5 by 1. Rated 5 out of 5 by Anonymous from A good choice for small places A good soft key light when you are lighting in a tight space. is the inside silver or white?